Having helped destroy other nations far away, our former prime minister — “peace envoy” to the Middle East — is a criminal. 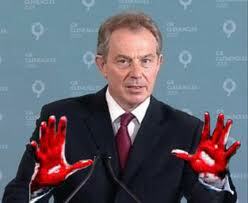 Tony Blair must be prosecuted, not indulged like Peter Mandelson. Both have produced self-serving memoirs for which they have been paid fortunes; Blair’s, which has earned him a £4.6m advance, will appear next month. Now consider the Proceeds of Crime Act. Blair conspired in and executed an unprovoked war of aggression against a defenceless country, of a kind the Nuremberg judges in 1946 described as the “paramount war crime”. This has caused, according to scholarly studies, the deaths of more than a million people, a figure that exceeds the Fordham University estimate of deaths in the Rwandan genocide. In addition, four million Iraqis have been forced to flee their homes and a majority of children have descended into malnutrition and trauma. Cancer rates near the cities of Fallujah, Najaf and Basra (the latter “liberated” by the British) are now higher than those at Hiroshima. “UK forces used about 1.9 metric tonnes of depleted uranium ammunition in the Iraq war in 2003,” the Defence Secretary, Liam Fox, told parliament on 22 July. A range of toxic “anti-personnel” weapons, such as cluster bombs, was employed by British and US forces. The bombings in London on 7 July 2005 were a direct consequence of Blair’s actions. Documents released by the high court show that British citizens were allowed to be abducted and tortured under Blair. In January 2002, Jack Straw, then foreign secretary, decided that Guantanamo was the “best way” to ensure that UK nationals were “securely held”. Instead of remorse, Blair has demonstrated a voracious and secretive greed. Since stepping down as prime minister in 2007, he has accumulated an estimated £20m, much of it as a result of the ties he developed with the Bush administration. The Advisory Committee on Business Appointments, which vets jobs taken by former ministers, was pressured not to make public Blair’s “consultancy” deals with the Kuwaiti royal family and the South Korean oil giant UI Energy Corporation. He gets an estimated £2m a year for “advising” the investment bank JPMorgan and undisclosed sums from other financial services companies. He makes millions from speeches, including reportedly £200,000 for one speech in China. In his unpaid but expenses-rich role as “peace envoy” in the Middle East, Blair is, in effect, a voice of Israel, which has awarded him a $1m “peace prize”. In other words, his wealth has grown rapidly since he launched, with George W Bush, the bloodbath in Iraq. His collaborators are numerous. The cabinet in March 2003 knew a great deal about the conspiracy to attack Iraq. Straw, later appointed “justice secretary”, suppressed the relevant cabinet minutes in defiance of an order by the Information Commissioner to release them. Most of those now running for the Labour Party leadership supported Blair’s epic crime, rising as one to salute his final appearance in the Commons. As foreign secretary, David Miliband sought to cover up Britain’s complicity in torture. He promoted Iran as the next “threat”. Journalists who once fawned on Blair as “mystical” and amplified his vainglorious bids now pretend they were his critics all along. As for the media’s gulling of the public, only the Observer’s David Rose has apologised. The WikiLeaks exposés, released with a moral objective of truth with justice, have been bracing for a public force-fed on complicit, lobby journalism. Verbose celebrity historians such as Niall Ferguson, who rejoiced in Blair’s rejuvenation of “enlightened” imperialism, remain silent about the “moral truancy”, as Pankaj Mishra wrote, “of [those] paid to intelligently interpret the contemporary world”. Is it wishful thinking that Blair will be collared? Just as the Cameron government understands the “threat” of a law that makes Britain a risky stopover for Israeli war criminals, Blair faces a similar risk in a number of countries and jurisdictions, at least of being apprehended and questioned. He is now Britain’s Kissinger, who plans his travel outside the US with the care of a fugitive. Two recent events add weight to this. On 15 June, the International Criminal Court made the landmark decision to add aggression to its list of war crimes that can be prosecuted. It defines this as a “crime committed by a political or military leader which by its character, gravity and scale constituted a manifest violation of the [United Nations] Charter”. International lawyers described this as a “giant leap”. Britain is a signatory to the Rome statute that created the court and is bound by its decisions. On 21 July, Nick Clegg, standing at the Commons despatch box, declared the invasion of Iraq illegal. For all the later “clarification” that he was speaking personally, the Deputy Prime Minister had made “a statement that the international court would be interested in”, said Philippe Sands, professor of international law at University College London.